The 3-6-1 is a rarely used formation, which could bring some interesting opportunities in top-class football. The aim of this analysis is to give a small example of a system utilizing this formation. Formations are indeed mostly just telephone numbers, but they can inherit certain characteristics. A 10-0-0 would, due to its extremeness, not really give much presence in the front two lines, right? Obviously, such extreme cases are virtually non-existent. There are just a few tendencies towards specific formations with some variations and action patterns that create a system. The “problematic” zones of most formations can be neutralized (or enhanced) by specific actions / movement patterns. The system – which involves the formation, the roles, the quality of the players, the structural background, the movement, etc. – thus is mostly the focus of our analyses. Nevertheless, there seems to be a formation which might bring very interesting possibilities and seems underused. I am talking about the 3-6-1. Some teams even were referred to as 3-7-0 (Barcelona vs Santos, 2011) or 4-6-0 (United, 2007/08) which wasn’t really true as this mostly referred to the type of players they used compared to the typical use of players in more classical interpretations of these formations. United, for instance, still pressed mostly in a 4-4-2 and didn’t really have at least one player positioned in or at the last oppositional line. Other formations like the 5-4-1 with flat four or the 4-5-1 with flat midfield five however were utilized in the last years. BVB showed some good performances with the latter system under Jürgen Klopp, the 5-4-1 was played by Costa Rica at the last World Cup successfully. However, both formations – if interpreted how the ‘telephone number’ suggests – have an obvious tendency to lack the presence upfront and at the press in higher zones. Also, they ability to transition to possession or counter effectively can be impaired. Again this can be solved at times with the use of midfielders or wingers leaving the line to press higher, but this fundamental problem of these formations needs specific players, certain situations or, obviously, a formative change to be solved. Still, the basic idea of these formations with just one player in the most forward line is interesting because you can shape yourself with many players behind the ball and occupy the deeper zones massively. 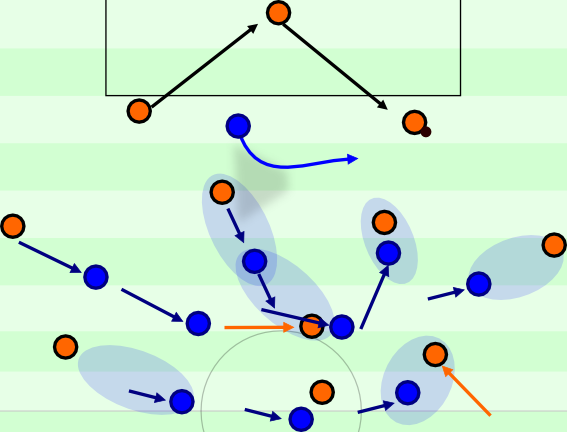 An attempt to connect this high presence in the middle, the enormous width staggering (Breitenstaffelung in German) and the high amount of players in the first two lines with more presence and access in the higher zones, both in possession and out of it, could be the 3-6-1. Atlético created the 3-6-1 a couple of times against Barcelona years ago situationally. Diego Simeone is thus the official SV-Patron of this article. In a way, four or five players are redundant in the last lines, if you have enough pressure and presence in front of these zones. Chile and Bayern for instance had a high stability defensively and against the ball with a back three where just a few players would situationally drop deeper; either the wing-backs or the central midfielders. Also the pendulating back fours of nominal 3-5-2 and 3-4-3 formations worked well at the World Cup and for some teams (like Liverpool under Rodgers in their best phases or Gladbach versus Bayern yesterday). A 3-6-1 gives teams the possibility to flexibly act with a back three, back four or back five. After all, with six players in a chain in front of the first line there are enough players to resolve from the chain, drop deeper and re-organize if needed. The same can of course be done further up. The six players in the central line can leave forward and support. This movement is possible in the 4-5-1 and the 5-4-1, too, but due to the amount of players this is not only possible in a more flexible way, but also with higher intensity. You can utilize more players or leave the lines further and longer, because the cover behind is higher. 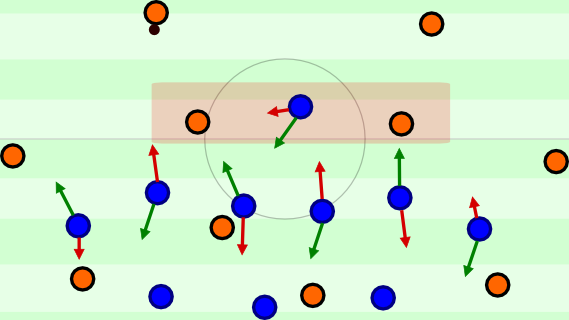 The amount of players also enables more access to the second line of the oppositional build up. Even if, for example, three players push forward at the same time, a compact and supporting 3-3 block remains behind as cover. Due to the Sechserkette it’s possible to accomplish vastly different pressing patterns with diverse effects. The possibilities are almost endless. To show the theoretical effectivity of this I decided to create one specific system with concrete movement patterns which could be used. The 3-6-1 may sound fundamentally defensive, but like virtually any line-up it can be interpreted more offensively. With a very high pressing there are some interesting and potentially interesting side effects of the initial 3-6-1 staggering. 3-6-1-base formation at high pressing. In this situation the opposing keeper has the ball, the two central defenders are initially left open. The wingers in this scenario are behaving more man-oriented, while the central players remain on their positions. The opponent will be forced to build up. If they hit it long, we have a much better staggering for the second balls with much more presence. Especially long diagonals to the wingers are useful, because the whole 3-6-1 block will move towards there and isolate them. In Germany, as avid readers of our site know, there is the Halbraum between wing and middle. The word, by the way, stems from the old formations with half backs, centre halves, inside forwards and so on. In German they became Halbläufer, Halbstürmer and Halbverteidiger which in turn led to the zones they mostly were positioned to become the Halbraum or Halfspace. In German coaching education they are used between middle and wings, coaches like Klopp and Tuchel refer explicitly to it. In the 3-6-1 we have basically two wingers or, to be more precise, one runner on the wing and one runner in the half space. Two central midfielders support them and together they move towards the middle, where they get supported by the back line shifting to the ball. Now it’s possible to create a high intensity and pressure on the ball with many players occupying the middle due to the ball oriented movement of the collective. The passes into central midfield or long balls seem open, but due to the amount of players and movement possibilities should be covered well. When the opponents starts the deep circulation, so does the pressing start. Movement of the 3-6-1 base formation in high press. Ball possession of the right central defender. The goalkeeper passes to the right centre back, which triggers the press. The central forward tries to isolate the central defenders, whereas the winger closes down the full back. 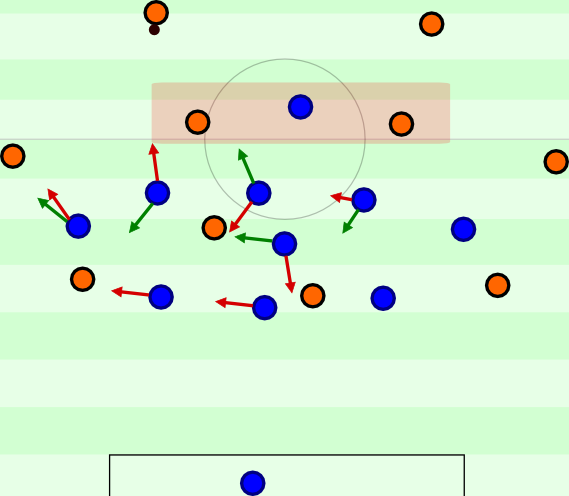 Alternatively, it’s possible to leave him open and focus more on the right winger of the opponent while letting them build through the side, but the first mentioned option creates a higher pressure. Also the winger can be let open with longer passes defended by the remaining defense and especially the runner in the half space. An interesting mechanism is to let one of the central midfielders advance to the oppositional central midfielder. The ball near is recommended but it can be also done with the ball far central midfielder with a long diagonal run to congest space more and try to prevent switches. In this situation the remaining central midfielders move towards the ball and the gap opened by the player who advanced forward to press. 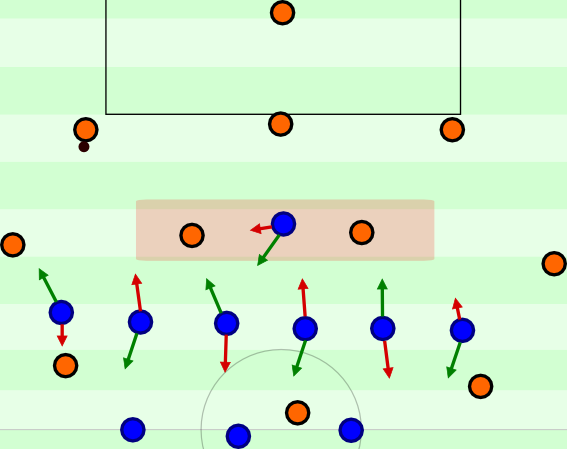 Against long balls to the left central midfielder of the orange team or diagonally to the left winger there is enough presence to immediately create access. It’s very hard for the opponent to penetrate the shape and even if they do so, the formation enables the possibility for massive backwards press and high compactness. But possession-oriented teams with good goalkeeper and strong ball circulation may play the ball over the goalkeeper quickly to the other side. Theoretically, this could lead to problems, but again the highly occupied second line is helping there. Response to the oppositional ball circulation around the pressing. The ball far players now again move towards the ball and shift. The centre forward can’t immediately press the second centre back or consistently defend after switches of sides, which is why he should drop deeper first and take the oppositional central midfielder in his covering shadow if possible. The previously quasi-man-marking player (central midfielder) drops deeper and returns to his abandoned position. The right half space runner moves out and closes down the first passing option. This mechanism should slow down the oppositional build up and the positive effects of their switch should be cushioned. On the ball side the side defender and the winger orientate towards their nearest oppositional player. They are not intended to cover them immediately, but keep distance first. With this, they should be allowed to the wings and the pressing team wins time for the movement of the players from the weak side. This is especially important for the three man back line. For very fast combinations and good movement of the opponent it’s perhaps slightly instable on the sides, which might lead to a more passive and more cautious 3-6-1-0 as counter measure. Position oriented and more cautious 3-6-1 (-0)–high press with two (or three) possible pressing schemes. In this variation the centre-forward is deeper whereby the oppositional centre backs can build up undisturbed. The question is: Where? This formation lives from it’s staggering-pressure (Staffelungsdruck). This means, that every supposedly open player is under immediate pressure even if he receives the pass properly due to the shape. The 3-6-1 also isolates him from relevant zones and team mates. The central forward now has to cover less space, he’s focusing on the space around and between the oppositional holders and when they split, they can be picked up by the midfielders. The green and red arrows show which opportunities are given to the opponent. 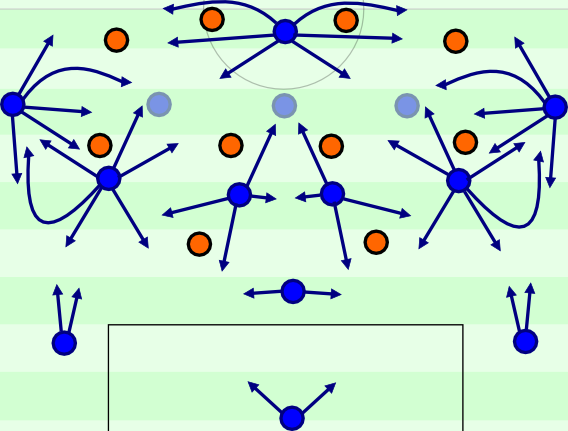 Both schemes create a 3-3-3-1 with extreme vertical compactness and three rows of three players mutually shifted to each other. While the red scheme attracts the opponents more towards the sides to attack them aggressively on the wing through shifting to the ball and having more access centrally, the green scheme is stronger (on paper, at least) after long diagonals in wing defending whilst still occupying the middle effectively. If the opposing team uses a deeper dropping holding midfielder, it changes little. On the contrary: The 3-6-1 should have it easier to keep the opponent in irrelevant zones and the movement when shifting should be simpler / more success stable. This applies however not only to the high press. Even a lower alignment can act with similar schemes. 3-6-1-basic staggering in midfield pressing. In the end, the formation is just somewhat drawn deeper and slightly adapted. The wing runners are a bit deeper, the pressing schemes have been adjusted. The principles still remain fairly similar. There are two mutually shifted 3-3-staggerings with minor differences. Personally, I think such a medium press would be quite interesting. The opponent can’t or at least won’t utilize the goalkeeper in these higher zones, has to play it back often and will have problems against a fairly positionoriented, passive defense. Long balls behind the defense might be defended with a lesser success probability but the slightly deeper wingers and a goalkeeper competently coming out of the box should lessen this and support the three central defenders. The height of this pressing variation and the formation in itself are interesting, because you can counter potentially extremely fast and effectively. Behind the oppositional defense there should be some space, also the row of six enables massive movement forward. Counter options after winning the ball. In this hypothetical situation above the 3-6-1 wins the ball in the left half space. The intercepted pass can be played immediately to the left wing runner who either moves up or pushes into the middle and opens space for the runner in the half space. The centre forward and the holding midfielder can move along into the open green space to support zonal changes of the ball or advance directly. Both lateral players on the ball far side are moving forward and thus creating enormous problems for the opponent because they flexibly occupy the further zones and in the same time can take advantage of the higher positions of the oppositional full back and winger. 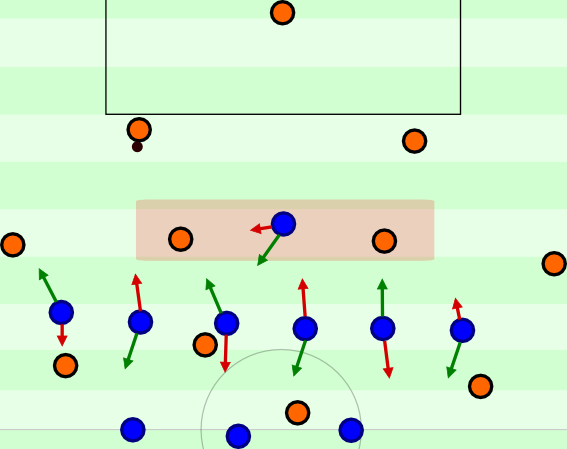 These counters thus allow to attack a high number of different spaces and provide many options while still being covered well with two central players and three defenders. The special thing about the counters in this system is the central coverage while maintaining great spacing in the zones. That’s very important for counters: Have width, but still keep the connections and options for combination play alive. The centre forward is the only player to covert he middle first and then he can move laterally to open space, act as supporting player for flick-ons and lay-offs or for direct passes in behind the defense. On both sides there are also two players who can combine in narrow spaces, change positions and open space for each other. On the other side there are two passing options for a switch. There is again the possibility to combine in small spaces, change positions and give passing options hard to cover for the opponent. Return passes into the well-staffed space in front of the defense or directly into the centre forward give depth into both directions. All in all, this is a quality shape that is useful for movement in counters, but also in ball circulation. In this scheme the player in the right half space would drop to cover for long diagonals with the wing runner staying higher, the central midfielders occupy the middle and the ball near players are fairly man-oriented. The side defender of the back line acts a bit more aggressive in terms of leaving the line and press, because the central midfielders and the runner in half space are a bit more conservative positionally. They are moving out when the ball comes into the middle. This makes a very central shape where the runners near the ball can create access and the centre forward attacks the back pass of the opponent if it occurs. This system is different to the above system, which shows the various possibilities of one formation. Of course, such a style of play requires a suitable player material. A team that would be perfectly suited is Chelsea. Note: This article was written in German first in winter 2014/15 before the transfers (and crisis) of Chelsea occurred. The intention of this line-up is to give an approximate indication about which player types could occupy the respective positions in such a 3-6-1 formation. The above mentioned back three would be utilized quite offensively, yet all three of them have the defensive skillset for this system even if they were often utilized as full backs. Alternatively, Terry, Zouma and Cahill are also possible. Hazard, Oscar, Willian and Cuadrado would occupy the four wing/halfspace positions. All of them – except Hazard probably – are quite good defensively for wingers and on the other hand all of them can dribble. Matic and Fabregas act as circulation players in the middle. 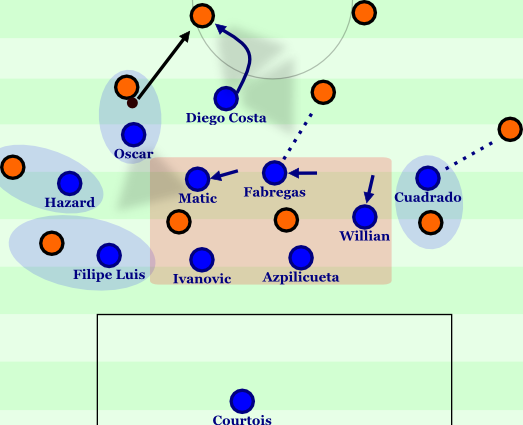 Fabregas can roam forward with good coverage to utilize his strength in final passing and circulation. Matic on the other hand is the more strategic distributor in deeper zones and also the one who’s more suited to tight situations. A fit and content Diego Costa is a very good centre forward for this system due to his movement, his physical abilities and the support around him. The system and environment for him resembles partly what made him so important for Atlético. Obviously, Hazard could be used in a different position and players like Ramires or Obi Mikel could get into the team. The 3-6-1 would be therefore interesting for a team like Chelsea which has the abilities for such a system due to their squad and obviously their competent coach in terms of playing against the ball and in counters. The formation is not only potentially outstanding for the transition (in both directions), but also useful in own possession. Let’s start at the back: The goalkeeper can move laterally to offer himself as passing option for the side defenders or to switch the game into the middle or to the other side. Obviously, with goalkeepers like Neuer, ter Stegen, Sommer, Buffon, Bravo, Reina or De Gea it’s even possible to try it outside of the box. The central one of the back three tries to open passing lanes to two central midfielders which can act narrow to each other for fast combinations or split a bit wider, too. The side defenders of the back three move a bit towards the ball and cover, but if it suits their profile they can also advance forward to attack. The wing and half space runners can change positions, move freely and overload the space between the lines and the middle. The three light blue points in the space between the lines are potentially three positions which can be filled flexibly by these deeper players. The other players in higher zones should support these rotations and create overloads. For opening space and layoffs the central forward is responsible. This should make it hard for the opposition to cover properly, especially when utilizing man marking. Especially their full backs and wingers could get problems about who to mark. Obviously trying to use all the possibilities above would be too much for many players, especially when not having much training and preparation time. Not all movements are simple or done cleanly and with high success stability. The latter thing could be a problem for the 3-6-1. The 3-6-1 is – like every other formation – shaky against very good and well-adapted movement, fast circulation with good layoffs and intelligent switches of attacks, incl. ball position, rhythm and directions. A very good opponent can break it. 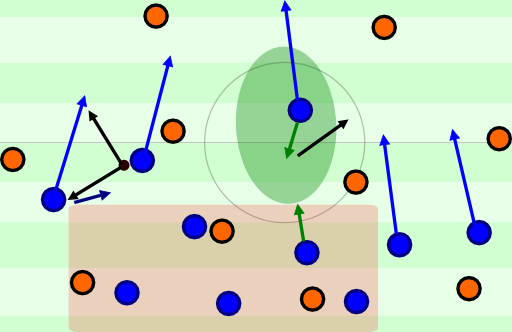 Also there are some efficiency problems in the use and integration of some players (wings, mainly) against the ball and with the ball and perhaps problems in harmonical movement in pressing in front of the 3-6-block, some possible problems against long balls behind the defense and playing out of the oppositional counterpressing if done with high intensity. Still, it’s a promising formation with many possibilities (for instance a switch to a 3-1-5-1 is easily possible) and no bigger weaknesses than others. In the 3-1-5-1 it’s possible to use a holding midfielder who drops into the back line – like Busquets did for Barcelona under Guardiola in 2011/12 – when needed to support the width staggering. After the recent uses of the 4-5-1 and 5-4-1 the 3-6-1 should be next. It integrates the reasons why these two formations were used (in different systems) in a different way and has other, different properties. The goal of this article was to show this and some possible interpretations.